Civilian airfield requisitioned for war use. 01 Aug 1940 as part of HMS MALABAR III while under construction. 31 Dec 1944 transferred to War Office on loan. 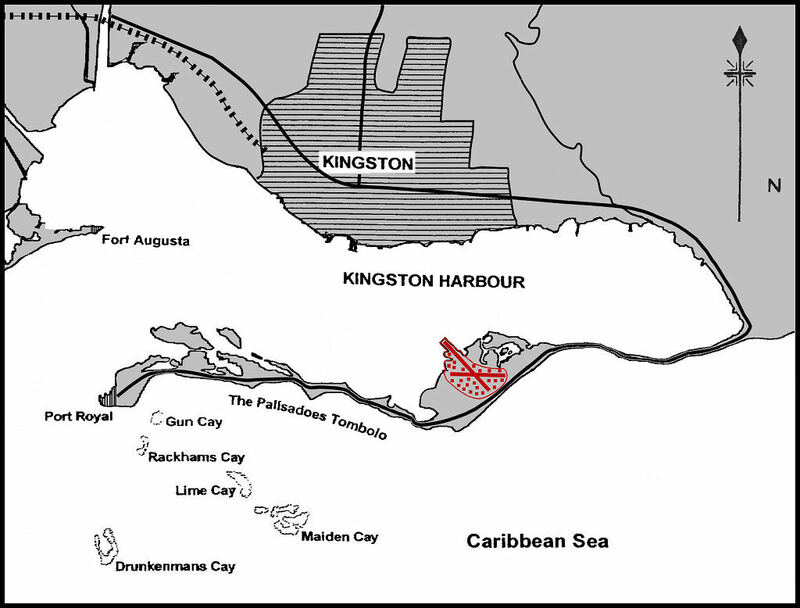 The airfield lies at the mid point of the long thin strip of land known as the Palisadoes Tombolo which forms the southern boundary of Kingston Harbour. 5 miles W. from the mainland and 51/2 miles E from Prot Royal. Access by road to Port Royal 51/2 miles (R) W., and to Kingston 10 miles (R) N.
Railway station at Kingston, connects to Spanish Town12 mi ENE and connections to Montego Bay and Port Antonio. 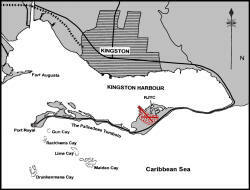 Kingston harbour is al deep-water harbour and the Prot of Kingston is served by multiple wharves. . The airfield accessible to from the harbour and facilities exist for the seaplanes. --/-- QDM.---°/---° ....--- X -- yds. Detachments of aircraft disembarked from Armed Merchant Crosiers and RN ships operating in the Caribbean between June 1942 and May 1943. Disembarked from HMS INDOMITABLE 28.11 - 03.12.41. Disembarked from HMS INDOMITABLE 06 - 12.12.41. Equipped with 18 Fairey Fulmars. Disembarked from HMS FURIOUS 01.10.41. Embarked in HMS ILLUSTRIOUS 02.12.41. Equipped with 6 Fairey Swordfish Is. Formed at Palisadoes 01.02.42 Moved to USNAS Norfolk 22.03.42. Equipped with 4 Fairey Swordfish Is. Disembarked from HMS FORMIDABLE 23.08.41. Embarked HMS ILLUSTRIOUS 02.12.41. ]Equipped with 6 Fairey Swordfish Is. Formed at Palisadoes 10.12.41. Embarked H.M.S. ARCHER 19.03.42. Formed at Palisadoes 15.02.42. moved to USNAS Norfolk, Virginia 12.03.42. Formed at Palisadoes 01.03.42, departed for USNAS Floyd Bennett Field, New York 13.05.42. Formed at Palisadoes 01.05.42, departed for USNAS Floyd Bennett Field, New York 07.07.42. Equipped with 12 Sea Hurricane IIbs. Palisadoes was situated on a bulging section of the Palisadoes peninsula, a ten mile strip of land which links Port Royal, at its western end to the mainland, the was about four miles from the mainland. Palisadoes was chosen as the location for the capital city's airport due to its close proximity to Kingston, its ability to accommodate land and sea planes, its accessibility by road and boat The airfield was originally constructed in 1938/9 by local officials as a civil airport to serve the town of Kingston but was requisition after the Second World War commenced. In August 1940 the Royal Navy established a RN Depot at Kingston and began to develop the Palisadoes airfield as Naval Air Station; both were under the control of HMS MALABAR in Bermuda and was commissioned as HMS MALABAR III on August 1st 1940. 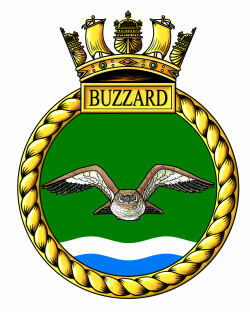 The station was ready by July 1941 and was re-commissioned as an dependant command bearing the ship's name HMS BUZZARD on July 12th 1941. The first squadron to arrive on the station was 829 squadron which disembarked it's 6 Swordfish from HMS FORMIDABLE on August 23rd. The ship was en-route to the US navy Yard at Norfolk, Virginia for repairs to battle damage and this provided the opportunity for spell of R&R at Palisadoes . They were soon followed by 810 squadron's 6 Swordfish which disembarked from HMS FURIOUS on October 1st; they had been on the fleet carrier for convoy protection duties escorting a Jamaica bound convoy and were also put ashore for R&R before being reassigned. From October consignments of crated Swordfish began arriving from the UK by sea, these were assembled by the station workshops in readiness for forming several new squadron that would enter service in the New Year. At the start of November 1941 a detachment of 4 Sea Hurricanes of 880 squadron arrived on the station having been disembarked front HMS INDOMITABLE on the 4th for a four day stay. More aircraft from INDOMITABLE arrived on the 28th when a further detachment of 3 Sea Hurricanes from 880 arrived as well as 18 Fulmars belonging to 800 squadron. The two squadrons on the station for R&R departed on December 2nd, both embarking in HMS ILLUSTRIOUS for passage to Norfolk, Virginia. All of INDOMITABLE's aircraft re-embarked the following day., only to return on the 6thl this time a detachment of 2 Sea Hurricanes accompanied the Fulmars. The first of 6 new Swordfish squadrons was formed at RNAS Palisadoes on December 10th when 834 Torpedo-Bomber and Reconnaissance squadron commissioned equipped with 4 Fairey Swordfish. Five of the new squadrons were intended for the new American built Auxiliary aircraft carriers due to enter service in the coming months- 834 was allocated to the first of these new shops HMS ARCHER. On December 12th 800 squadron's Fulmars re-embarked in HMS INDOMITABLE ,the Sea Hurricanes made their final departure on 13th. This left only the 4 Swordfish of 834 resident on the station over he Christmas and New Year, busy working up in preparation for the Arrival of their ship due in March 1942. The second new Swordfish squadron, 816, was commissioned on February 1st 1942, again equipment was 4 Fairey Swordfish. This squadron was allocated to the new carrier HMS AVENGER. They were followed by 835 squadron which commissioned on February 15th with 4 Fairey Swordfish and 836 on March 1st equipped with 6 Swordfish. After a short work up 835 squadron moved to USNAS Norfolk, Virginia, arriving there on March 12th. This unit was not joining a new carrier but instead embarked in HMS FURIOUS for passage to the UK. 834 was next to depart embarking HMS ARCHER on the 19th. 816 squadron departed next, arriving at USNAS Norfolk March 22nd to join HMS AVENGER. The 6 aircraft of 836 squadron, now the sole flying unit on the station, continued working up during April and into early May. They were joined May 1st by 837 squadron which formed here with 4 Swordfish. Their work up complete 836 before departed for USNAS Floyd Bennett Field, Virginia on May 13th to await HMS BITER. June 1942 saw floatplane support duties added to the tasking of RNAS Palisadoes which was to provide servicing for Vought Sikorsky Kingfisher floatplanes and Walrus amphibians from Catapult flights aboard Armed Merchant Crosiers and RN ships operating in the Caribbean. The last of the squadrons to form at RNAS Palisadoes was 840 squadron which commissioned on June 1st with 6 Fairey Swordfish for service in HMS BATTLER. 837 departed for USNAS Floyd Bennett Field, Virginia on July 7th leaving 840 squadron, the last squadron to operate from the station before they departed for USNAS Miami on October 25th 1942. It is not clear whether RNAS Palisadoes was tasked with heckling reserve aircraft stocks, it did ha0wever have the equipment and infrastructure to support Torpedo-Bomber and Reconnaissance squadrons and floatplanes. With all of her squadrons dispatched and only occasional catapult fight aircraft visiting the station HMS BUZZARD was paid off on July 16th 1943 placed on Care & Maintenance status at 3 months notice to reopen on July 17th 1943 and borne on the books of 'MORGAN', RN Depot, Kingston. RNAS Palisadoes was finally closed on December 31st 1944 and returned to civilian use as Kingston's airport.